California Burritos are a must eat before you die burrito! California Burritos are arguably the best burritos in the world. They are stuffed with thinly sliced, tender marinated Carne Asada, cheese, salsa, avocado crema and the best part – Mexican French Fries!!! 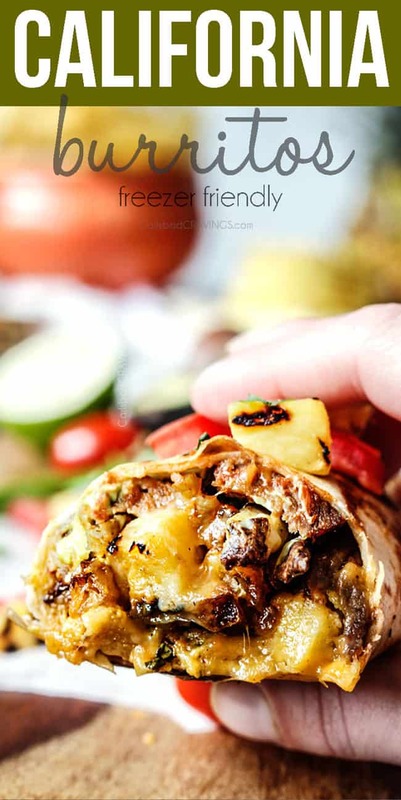 These California Burritos are also freezer friendly, for an easy bake and serve dinner! Patrick adores carne asada burritos, but he doesn’t just devour carne asada burritos every week, he devours carne asada burritos WITH French Fries, also known as California Burritos, and a staple for hungry surfers. They are the best burritos as far as these San Diegans are concerned and have a special place in San Diego culture, just like the fish taco. 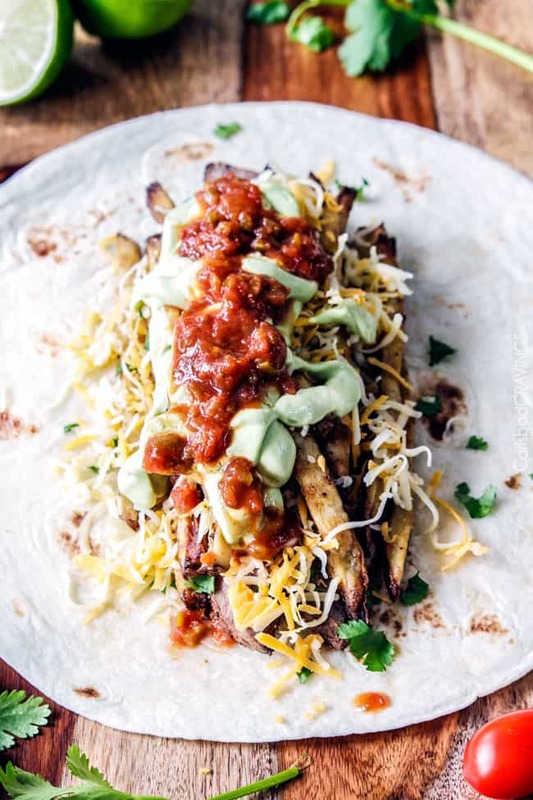 The California Burrito begins with a huge flour tortilla topped with juicy, marinated and spice rubbed, grilled steak, then piled high with baked Mexican Street Fries, loads of cheese, guacamole, and sour cream – think fiesta cheesy steak and potatoes with all the fixins! After I conjured up my favorite carne asada recipe, I knew California Burritos were next on the make ASAP list. And they should be at the top of your make ASAP list! If you’ve never heard of a California Burrito even if you live in California – you are not alone. California Burritos originated in San Diego at one of the -berto’s restaurants in the 1980s and are uniquely San Diegan. The Fresh MXN chain (formerly Santana’s) also claims to be the originator of the California Burrito but my money is on -berto’s. No matter who invented the original California Burrito, the important thing is YOU can make your own California Burrito recipe at home! Your family and friends will LOVE you for it. What is in a California burrito? tortillas: use large flour burrito size tortillas for the ultimate California Burrito experience. You can always cut these burritos in half for smaller portions. I prefer raw/uncooked tortillas found in the refrigerated section like Tortilla Land (I buy mine at Costco). They are thinner so they crisp up beautifully! carne asada: California Burritos are always made with carne asada and my recipe is simply the best! 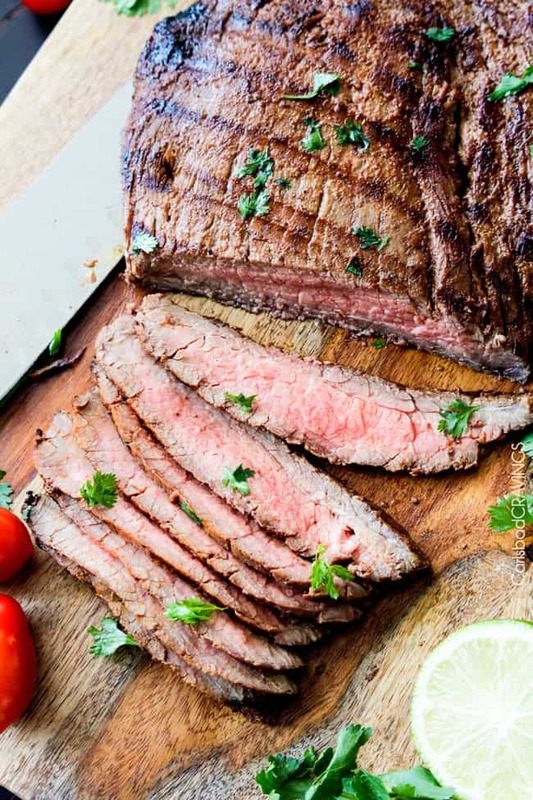 You can use skirt or flank steak which gets marinated in orange juice, lime juice, soy sauce and a splash of liquid smoke then rubbed with cumin, chili powder, smoked paprika, garlic and onion to emerge highly flavorful, rich buttery and melt-in-your-mouth texture. cheese: you can use 2-3 cups cheese or even more if you feel like living on the culinary edge. I like a combination of sharp cheddar and pepper Jack but you can use just all cheddar if that’s what you have on hand. French fries: the French fries are spiced with salt, pepper, garlic powder, ground cumin and chipotle pepper and are SO so addicting all on their own. salsa: I love my Salsa recipe for these California Burritos but you are welcome to use your favorite store bought salsa. avocado crema: Instead of using sour cream and guacamole, I make a spectacular Avocado crema with avocados, sour cream, mayonnaise, lime juice, cumin, salt and garlic powder. It is on of my favorite condiments on the planet as seen in my Chile Lime Chicken Tacos. That being said, you can use sour cream and guacamole instead of the crema if you prefer. Can I Customize California Burritos? California Burritos are delish just as described above, but part of their beauty is they are totally customizable. 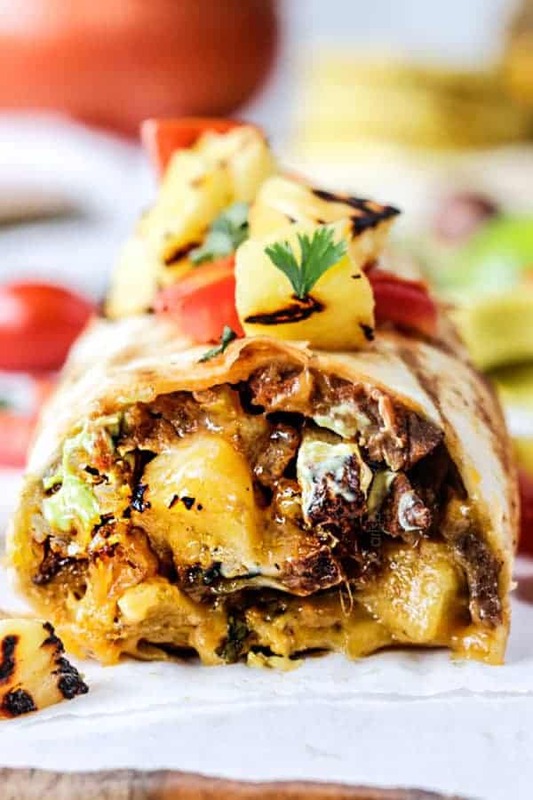 You can add rice or black beans not traditionally found in California Burritos or anything your heart desires because there is no right or wrong when making your own burritos – you might just not be able to call them a California Burrito ;). 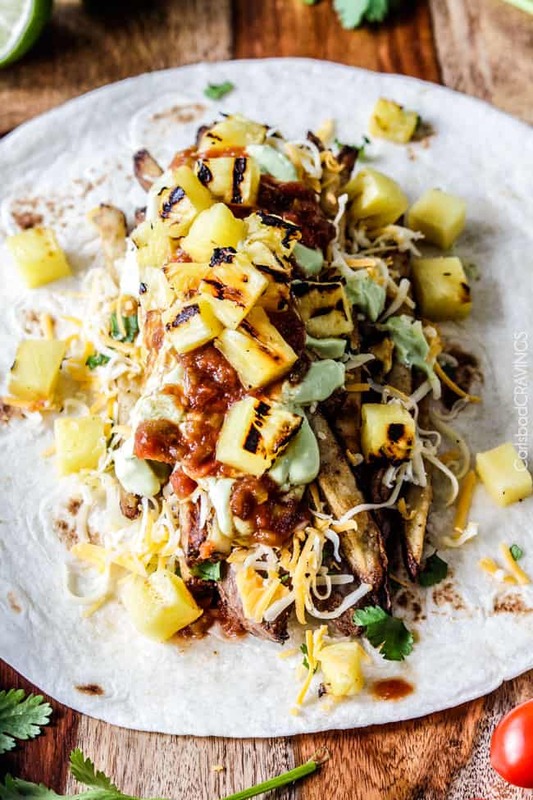 Our favorite add-in to the California Burrito is pineapple. 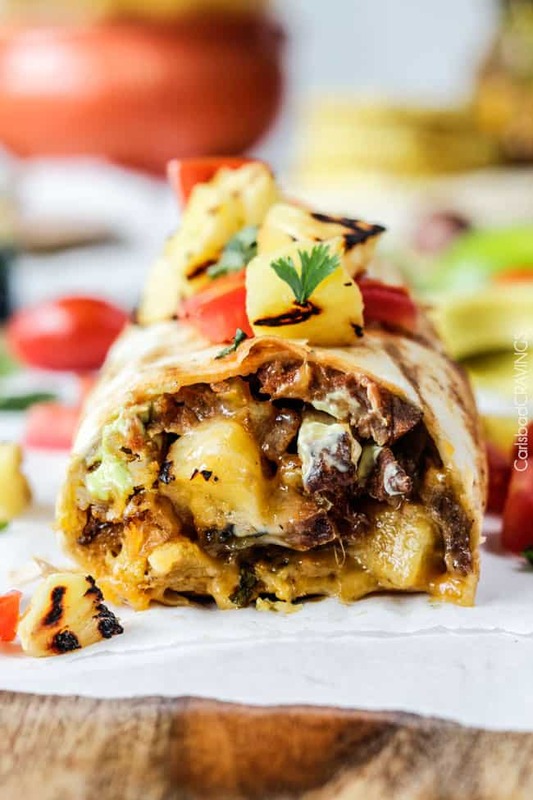 We got this idea from a local restaurant burrito who named it the “Carlsbad Burrito.” The sweet, caramelized pineapple is just made for the smokey meat and spiced Mexican Fries – drool….. So the Carne Asada Burrito becomes a California Burrito and finally the ultimate Carlsbad Burrito: AKA the burrito my sister-in-law has been asking me to recreate since she tasted its perfection forever ago – the burrito we take everyone visiting to devour – the burrito now we can all devour at home at a fraction of the cost with an explosion of flavor. What Do I serve with California Burritos? 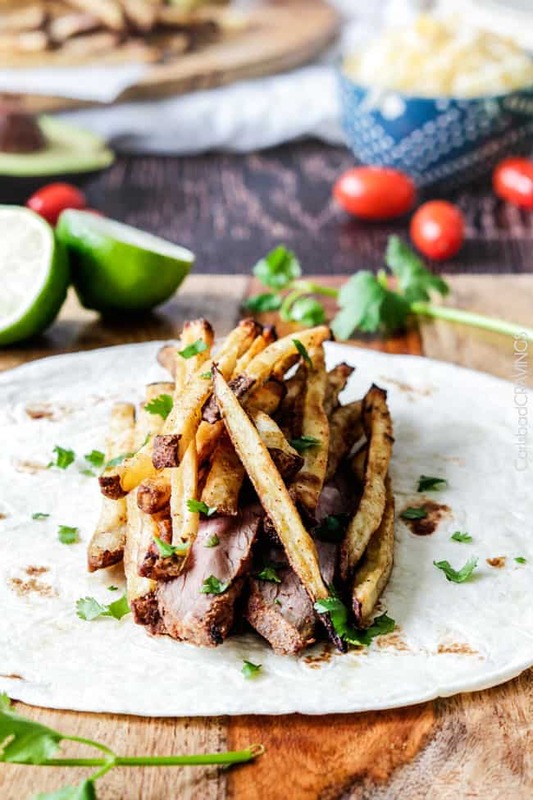 Serve your California Burritos with Mexican Rice or Cilantro Lime Rice, black beans, a big pile of chips and either homemade salsa, or salsa verde and you have a restaurant quality meal in the comfort of your own home! and top it all off with Churros! How Do I FREEZE California BURRITOS? Cool Filling: Let carne asada and French Fries cool otherwise you will end up with soggy tortillas. Assemble: Assemble California Burritos per instructions. Foil: Wrap individual burritos up tightly in foil. Store: Add frozen burritos to a large freezer size bag, remove excess air and seal. Freeze for up to 3 months. How do I thaw California Burritos? Bake: Remove frozen California Burritos from foil and place on a baking rack. Bake at 400 degrees for 30-40 minutes or until completely warmed through and toasted. Microwave: Remove chicken burritos from foil. Microwave for approximately 4 minutes or until warmed through. If you want to crisp up your microwaved burritos, then you can broil in the oven or pan sear per instructions. This California Burrito is waiting for you and is ready to become your new cheesy, meaty, avocado, salsa, French Fry, pineapple packed new obsession! Looking for more burrito recipes? 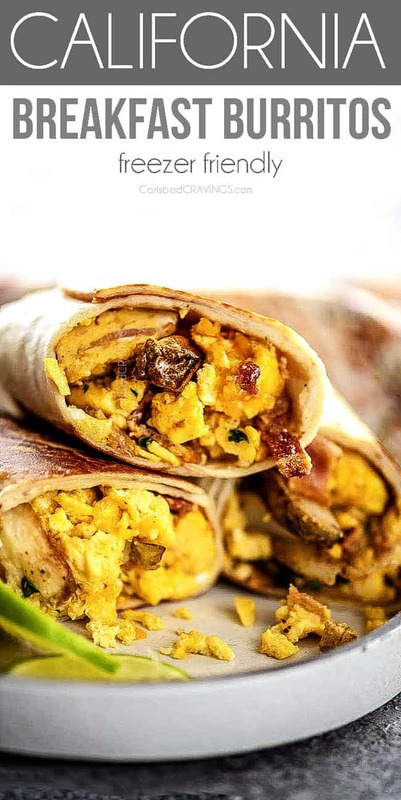 WANT TO TRY THIS CALIFORNIA BURRITO RECIPE? PIN IT TO YOUR MEXICAN or DINNER BOARD TO SAVE FOR LATER! Prepare French Fries according to directions. Set aside. Add Avocado Crema ingredients to your blender and process until smooth. Store in the refrigerator until ready to use. 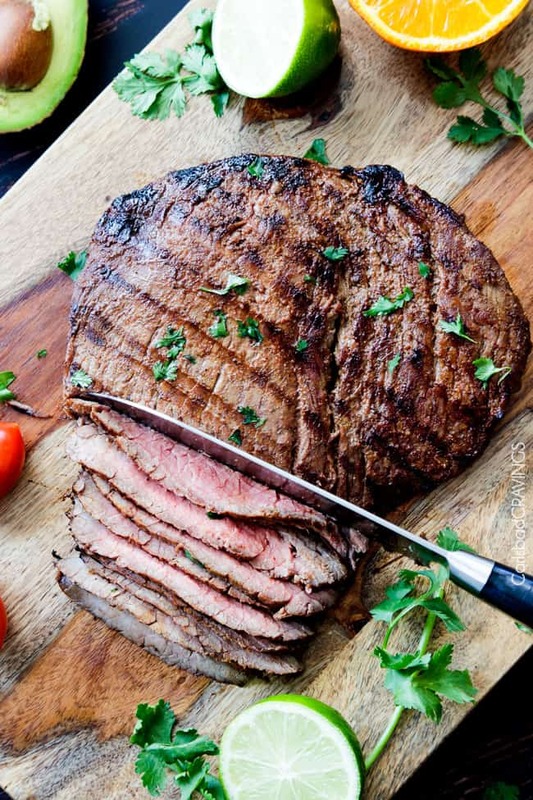 Grill marinated/rubbed Carne Asada according to directions. Meanwhile, wrap tortillas in foil and place in a preheated 350F degree oven for 10 minute so they are warm and pliable (optional but recommended). 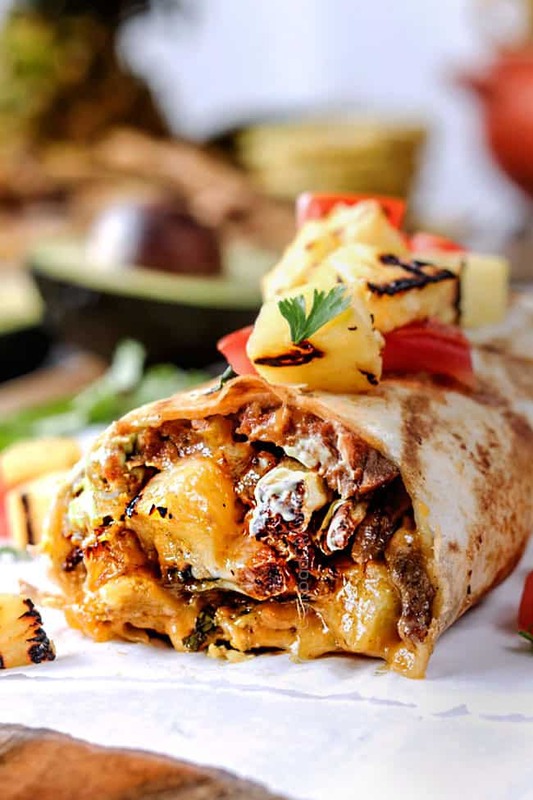 To assemble, layer carne asada in center of each burrito followed by, fries, cheese, avocado crema, salsa then pineapple. Fold in top and bottom and roll tightly in burrito style. Optional: To brown burritos as pictured, lightly grease a skillet with olive oil and heat over medium high heat. Add burritos one at a time, rotating as each sides turns golden. Garnish burritos with extra avocado crema, salsa and hot sauce to taste. *You may substitute the Avocado Crema for sour cream and guacamole. Wow. Those burritos are amazing. The idea of putting fries in a burrito is just so good. Can’t wait to try this in my kitchen. Hi Dorothy! Oh my goodness – your salsas sound Ah-mazing! 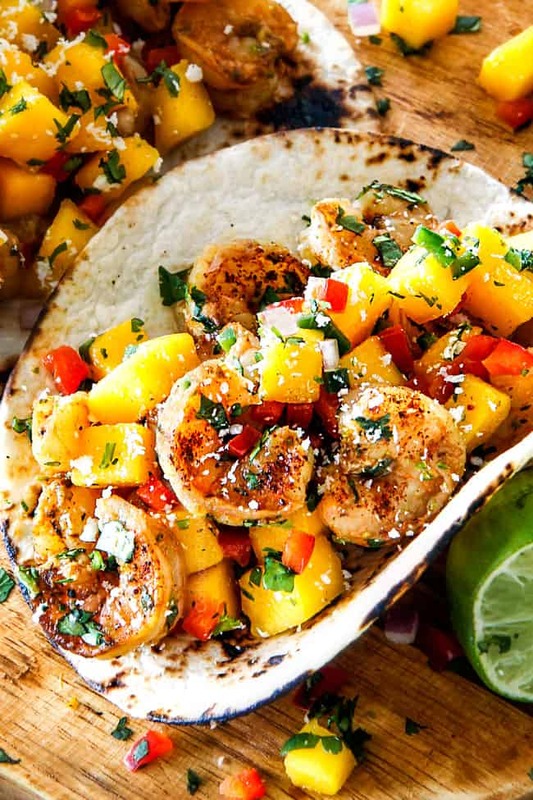 There is nothing like fresh salsa – especially with pineapple! This burritos would be even more amazing with one of your salsas! Enjoy!! Sorry Lorrie, I thought I had responded to your comment earlier but I think I just read it and smiled 🙂 I actually have Carne Asada Fries already made and ready to share and after reading this it sounds like it should be sooner rather than later 🙂 A big hello from Carlsbad to Portland!! Hi Michelle, welcome to my site! I think you’ll really love these California Burritos! I hope my recipes can fill your belly and your heart with a taste of home! Sending you a big hug from Carlsbad! Visiting Carlsbad in July. Which restaurant is the one you mentioned with the best burritos?